Mr. Media is recorded live before a studio audience of teenagers whose only apparent talent is spray painting the fence when my back is turned… right here in the NEW new media capital of the world… St. Petersburg, Florida! You Can Do A Graphic Novel byBarbara Slate. Order your copy today by clicking on the book cover above! No greater authority than Marvel Comics’ own Stan Lee asks that you not read Barbara Slate’s new book, You Can Do a Graphic Novel. I hate to counter the expresses wishes of the man who put the “excel” in “Excelsior!” but if you’ve ever thought about dabbling in the world of graphic novels and need a little help getting started, Barbara Slate may be the right hot poker for you. 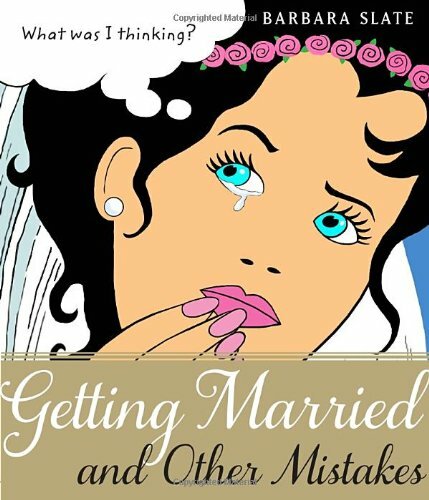 Order ‘Getting Married and Other Mistakes’ by Barbara Slate from Amazon.com by clicking on the book cover above! Slate is a veteran of comic books and illustration, having started her career with a line of “Ms. Liz” greeting cards and Cosmopolitan cartoons before graduating to comic books. She has worked for DC and Marvel, having illustrated everything from Barbie for Marvel, Beauty & the Beast for Disney and Betty & Veronica for Archie Comics. She’s also the author of the Yuppies from Hell series of graphic novels. Speaking of “from hell,” she’s a fellow parent of a teen-age daughter. Poor woman!